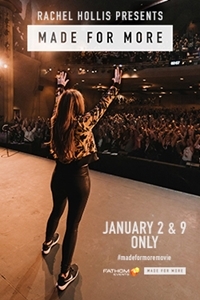 Returning to cinemas for a special encore presentation, Rachel Hollis presents: Made for More comes to cinemas nationwide January 2 and 9, featuring an all-new, exclusive coaching session. Rachel's fierce spirit and bold belief that she's here to change the world will inspire you to believe you can do the same - believing you're enough and will reignite those dreams you've been carrying around in your heart for years. They're all tackled in the documentary capturing an inside look into the two-day RISE event that has women walking away feeling changed forever. Whether you've been an OG since day one or this is your first time joining the tribe, this event will light a fire in your heart.